Chickadees and bluebirds have been disputing about who owns the birdhouse. Yesterday the female bluebird stood on the box as if her arms were crossed while the chickadees flitted around her, unable to enter. 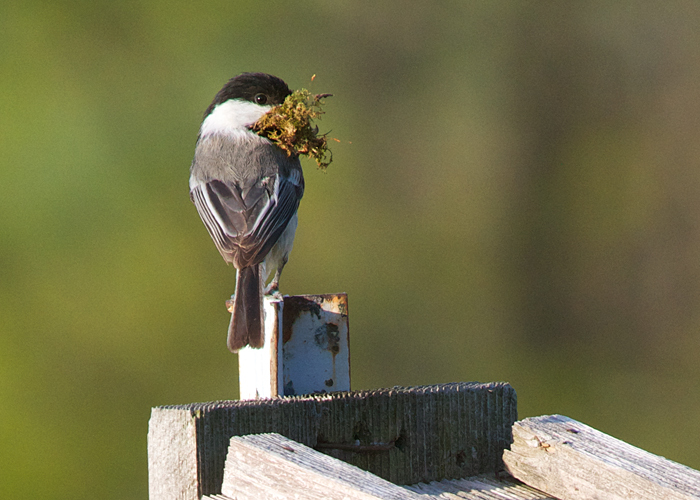 I think the chickadees have won, because this morning they're carrying wads of moss inside for a nest. I've seen chickadee nests before. Made entirely of moss, they are spongy and soft. Just right for coddling newly hatched baby chickadees. All the birds love a birdbath, including chickadees.